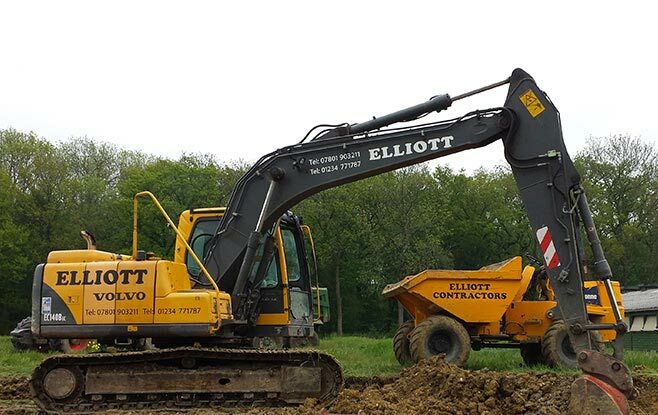 With over 30 years experience in the civil engineering industry, Elliott Contractors carries out contracts for domestic, commercial, industrial & agricultural clients. Our experienced and dedicated workforce undertake all aspects of groundworks including storm, foul & land drainage including septic tank installations & industrial yard intercepter installations. We also cover trench digging, foundations, oversites, site clearance, driveways and slabbing. Whether it is a large scale development or a small domestic project, we always aim to deliver a first class, competitively priced service. We have completed many diverse projects over the years and because we understand the importance of building good working relationships with our clients, we always endeavour to provide superior customer service and unrivalled customer support. Do we cover Groundwork & Drainage in your area? How do I get Groundwork & Drainage? Simply use one of the following methods to start the simple process of getting Groundwork & Drainage.